There isn't much I can add to other reports from those who attended the Ricoh (or Rioch as NYA calls it!) Arena; suffice to say that a draw, after leading for over an hour, was less then us Addickted hoped for. 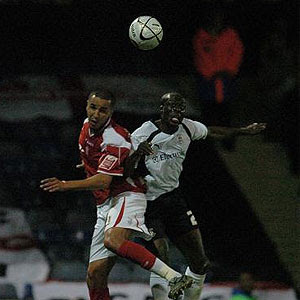 Lloyd Sam (left) scored his first league goal for Charlton after just fifteen minutes of the match, latching on to a good pass from Danny Mills, and cooly scoring into the far corner of the net. Thereafter, a blatant penalty went by, possibly due to the referee not wanting to upset the home locals; there can be no other explanation for the obvious taking out of Luke Varney, as he bore down on goal, going unpunished. It had all looked rosy for the visiting team, but eventually, some of the defensive errors that kept being handed to Coventry came back to haunt Charlton. In the first half, the first of several slips by Bougherra allowed Mifsud to hit the post, and later, when the pressure really started to tell just five minutes from time, another Boogie slip allowed the ball to ricochet off Chris Powell, and this time Mifsud buried the offering. In injury time, Chris Iwelumo missed a great chance to win the game; Andy Reid hung up a cross from the left, and big Chris dived to meet it perfectly. Sadly, it went just wide, with the keeper a mere spectator. The big man had a good game, so it was a shame that he didn't produce the winner we hoped for. Overall, playing with the league eleven that has started the last three games, the defence looked OK, apart from Boogie's mistakes, but it does tend to put pressure on itself through poor distribution. This may seem OK when Charlton are dangerous on the break, but there is a difference to being put under constant pressure by a Premiership team (for instance) and allowing yourself to be pinned back unnecessarily as Charlton seem to have done a few times this season. The midfield controlled the game for all the first half and some of the second, but struggles to join defence and attack when the game is stretched. Up front, Iwelumo won much ball in the air, and Varney got on the end of many flicks. McLeod, who replaced a tiring Varney twenty minutes from the end, also contributed but over-ran his one chance when almost through on goal. In a long season, this could become a game where we dropped two points, or won one - it's too early to say yet. With West Brom winning today (and scoring at will it seems), Charlton's draw sees them slip to third when five minutes more solid defending would have seem them as league leaders - and that's what hurts the most. There is plenty of time to hit the heights this season though, and when we see where we are in the table when we know, as does Pards, that we are not yet playing all that well, I don't believe that we have too much to worry about. On Tuesday, we travel to Hull; whereas Coventry had a great midweek cup win, Hull got thumped in the same competition by Chelsea. Hull did bounce back this weekend with a 3-1 victory over poor travellers Ipswich, and this now sets up another tough fixture for the Addicks. A win prolongs the unbeaten league stretch, but a draw or defeat would bring a run of three games without a win. 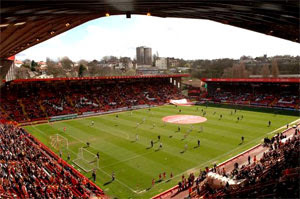 A week of fluctuating fortunes, with one team losing their unbeaten run and the other pulling off a terrific away win at a major Premiership ground, sees Charlton visit Coventry. How the midweek antics effect this weekends league game at the Ricoh Arena, we will have to wait and see. Coventry certainly pulled off the biggest League Cup coup of the week when they won at Old Trafford on Wednesday. Their two goals came from the small round Malteser who plays in sky blue, called Michael Mifsud. Young Mifsud has knocked in a few goals for the sky blues this season, and is a dangerous player that Alan Pardew’s charges will have to watch closely. For the Addicks, it was the opposite League Cup emotion; after going ahead at Luton, a great goal and excellent goalkeeping pegged them back, and the legs were stronger for the home team who ran in two goals in extra time to win 3-1. Luckily, we all know that Pardew made ten changes for the cup game, and that this weekends league team will look very different. So who will the Charlton boss (above) pick in an attempt to extend the unbeaten League run - Did anyone press for inclusion in the game against the Hatters? Are any of the “first team” in danger of losing their places? The answers are no and probably not, and the same eleven that played in the home games against Norwich and Leicester will probably take the field on Saturday! In goal, Nicky Weaver and Darren Randolph will switch places, with Weaver playing and Randolph sitting on the bench. The defence, after two clean sheets, got into a bit of a mess at times on Tuesday, and maybe some of this is down to Paddy McCarthy’s inclusion. I expect Danny Mills to edge out Yassin Moutaouakil at right back; the hopefully rejuvenated Chris Powell is certain to displace Osei Sankofa at left back; Jon Fortune will come in for McCarthy; and Madjid Bougherra should retain his place despite his colossal error in the lead up to the third goal in midweek. Sam Sodje may be pushing for a starting role, but unless Pards wants to drop Magic, then he’ll have to settle for the bench once more. The midfield has been bolstered by the availability of Matt Holland, Dean Sinclair, and Therry Racon, but I cannot see any of them getting the nod over Jose Semedo, Zheng Zhi, or Andy Reid, based on Tuesdays form. They are pretty good reserves to have though! Out wide, Lloyd Sam will feel extremely unlucky if he does not retain his place at the expense of Darren Ambrose, who will no doubt be on the bench. In attack, Luke Varney had another good 50 minutes or so at Luton after his recent ankle injury, and he will come back into the starting eleven alongside Chris Iwelumo. The only other option is to include the more defensive looking Svetislav Todorov, or Izale McLeod; Toddy is playing well but was marked out of the game on Tuesday by ex-Addick Chris Perry, while McLeod missed numerous chances and desperately needs a goal to compliment his reasonable outfield play. Subs from – Randolph, Sodje, Moutaouakil, Sankofa, McCarthy, Holland, Sinclair, Racon, Ambrose, Todorov, McLeod, J Thomas. Coventry started the season well, and had a couple of thumping wins that took them to the top of the table in the early part of the season; they were exposed in their last home game against at-that-time league leaders Bristol City, and Charlton will be hoping to do the same. With the home team boosted by the Old Trafford win, and urged on by a big-ish crowd, Charlton may do well to weather the early storm though. There is, of course, also a little matter of who the Coventry manager is nowadays, but he is someone who I, as a Charlton fan, wish to forget about as quickly as I can. If I do think of Iain Dowie, it is of him as a loser - when manager of some Croydon-based team that Charlton relegated, and also a loser when spending Murray’s millions this time last year. My one-to-watch in this game is going to be Nicky Weaver (left); our custodian is in good form (apart from maybe some of his distribution…), and has made crucial saves in recent games. He has not been busy though, and that may change this week, especially early on, as the home side seek to continue their form. Nicky is starting to show us, the fans, how good he really is, and it would be great if he could keep a few more clean sheets over coming weeks. I thought it time, what with so many new Charlton bloggers starting up this new season, to update the links to other Charlton blog sites that appears on the right hand side of my site. I want to have as comprehensive a working list as possible, so that all fans can jump from site to site as they fancy. I have removed old, non-updated in 2007 sites, and added a few more that have appeared over recent weeks. If your blog isn't showing, please let me know via the comments facility and I'll add it to the list. As widely expected, Alan Pardew made changes from the team that beat both Norwich and Leicester in the last two league games; ten changes in total, with only Madjid Bougherra getting consecutive starts, and that probably only due to Sam Sodje being cup-tied. The game started well for the visitors, with a goal after just four minutes. Who scored it was the subject of much debate; Izale McLeod crossed, and the radio said that Dean Sinclair bundled it through the keeper’s legs, and into the net. Sky Sports initially gave the goal to Todorov, but then amended that to Sinclair, before finally settling on giving it to Darren Ambrose (who did follow the ball in). Officially though, it is Sinclair’s first goal for the Addicks. Slowly though, the home side found their confidence, in part due to Charlton not capitalising on numerous chances to go further ahead, and Luton equalised with a great strike just before half time. 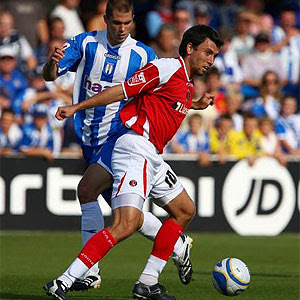 Darren Ambrose almost, unexpectedly, won the game for the Addicks near the final whistle, but in extra time the higher level of match practice that Luton had over Charlton’s reserves told, and they scored once more in each fifteen-minute half. 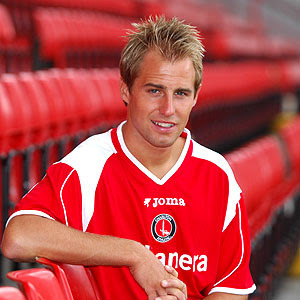 POSITIVE: Dean Sinclair scored and had a good game in midfield, on his first start for Charlton. He is good cover for our central midfield, and will be better for this game. NEGATIVE: Losing to lower league oppo once more; sure, Luton had their first team out, and we our reserves, but it does still look embarrassing. POSITIVE: Matt Holland and Yassin Moutaouakil returning from injury and getting plenty of minutes on the field. NEGATIVE: Izale McLeod missing a whole host of chances when he should have done better. Sadly, he even seemed unable to make the keeper work either, hitting almost all his shots well wide. NEGATIVE: Luton scored with their good volley. POSITIVE: Only Izzy got booked, so that shouldn’t have a lasting effect on suspensions later in the season. POSITIVE: All the team getting a good run out. NEGATIVE: Some of the team getting too much of a run out, having to play all through 90 minutes and extra time. That’s about all I can think of to say, and at least it means Alan Pardew will have something to say at training over the next few days, and his side to play Coventry on Saturday may be a little easier to pick. This week’s midweek game is a third round league cup tie, away at Luton, and once more Charlton go into the game as favourites. On an unbeaten run that stretches back over a month, Alan Pardew’s charges will be looking to continue their good form, and earn the possibility of challenging one of the better Premiership clubs in the fourth round. Pardew (left, telling his team the round) certainly has options when he decides who to give a run out to in this match, and the likelihood is that as many squad players as possible will get plenty of minutes playing time in this game. Although Nicky Weaver played in the first round at Swindon, it was Darren Randolph who stood between the posts in the last round home game with Stockport, and I expect our young Irish-American to don the gloves once more in this match. At the back, Pardew has already said that Chris Powell will not play (as he expends too much energy jumping out of the tunnel when we win! ), and that Danny Mills is unlikely to as well. The right back position will almost certainly go to the now fit again Yassin Moutaouakil and at left back, if he is fit, Ben Thatcher will probably also return, or if he isn’t yet fit enough, we could see a debut for young Aswad Thomas. The centre of defence is again likely to see changes from the now-ensconced league pairing, with Paddy McCarthy given a starting role (and the captains armband), and he will play alongside Fortune or Bougherra as, sadly, Sam Sodje played in the last round for Reading (and got sent off). I’m sure Sodje will have been as surprised as everyone to have made his first two outings for Charlton as a sub in midfield, but I'm sure he will eventually play at the back! In the middle, Darren Ambrose is sure to feature, having been used sparingly since the birth of his daughter ten days ago, and Therry Racon could be the holding player if Jose Semedo is given a rest as intimated. I’m not sure if Matt Holland is considered fit enough yet to take a starting place in midfield, but I do think he will feature. If he cannot start, I think Dean Sinclair may get the nod with Matty as sub. The wide man role looks like it might go to naughty-boy Jerome Thomas, if he has got the message about his attitude and how it can affect team-morale. If he is still in the manager’s bad books, we may get a glimpse of the unknown Martin Christensen, or possibly see another exciting outing from Lloyd Sam who didn’t get much of a kick this weekend. Up front, the obvious pairing seem to be to give the two forwards who need a game – Izale McLeod and Svetislav Todorov - the start they crave. Both could do with a good few minutes under their belts, and that would give both Chris Iwelumo (who may be sub) and Luke Varney a well earned rest. Subs from Weaver, Sinclair, Thatcher, Christensen, Holland, plus all the first team outfield players bar Powell, Semedo, and Mills (and Sodje who is cup-tied). The merits of the league cup are always under discussion: Is it good to continue a wining or unbeaten run, or possibly end a barren stretch; or do the games get in the way of the more important league aspect and simply bring unwanted injuries and suspensions? Well, at the moment, with the vast majority of our squad being fit and raring for a game, we can live with our best players being given a rest and not worry too much if the reserves get a few (hopefully only minor) injuries. We are on a good run, and of course it would be great to continue this; no manager wants his side to lose, be it a competitive league game, or a cup game against a non-league club or the Premiership champions. I think this game has actually come at a good time for the Addicks and will ensure that when the call comes for some of the fringe players to get a game, as they undoubtedly will need to over the course of this season (I reckon we still have at least 43 games to play! ), they are as ready as can be. My one to watch in this match is going to be Svetislav Todorov (left, with Andy Reid). Toddy has scored in the last three games in which he has featured, and another goal would go down well with the away fans at Kenilworth Road. With Varney and Iwelumo starting to look like a good pairing, our remaining Bulgarian needs to stay sharp and keep the pressure on the incumbent front two, especially as McLeod has assumed some sort of super-sub mantle. Pedro45’s score prediction is a continuation of the good form we have seen over recent weeks – I think there is too much at stake for the players put out to fluff their lines and make a mess of it. Sure, Luton will be up for the match, and could cause a few problems in a tight game, especially if some of the untried Charlton pairings do not gel as quickly/well as they might. I think we will win 2-1, which is a reflection of how tight it might be. It was a tenner wasn’t it Natalie? Up to second place in the league, following another two-nil home victory, the Charlton promotion-chasing machine rolls ever onwards. This victory was nowhere near as sweet as that of Tuesday’s game against Norwich, with some of the football quite often dour and cluttered, but Charlton were still way too strong for Leicester. 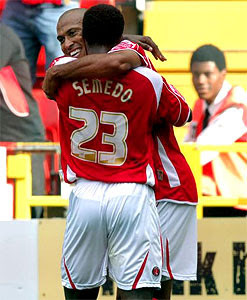 The goals came from Chris Iwelumo, after 18 minutes, and a first Charlton goal for Luke Varney (left), just five minutes later. The Foxes’s only noteworthy attack came early on when Clemence’s shot was tipped onto the outside of the post by Nicky Weaver. Alan Pardew, unsurprisingly, named the same starting team, plus the same bench, as he had in midweek. Sadly, the first twenty five minutes of glorious open football that we witnessed then was not to be repeated, as Leicester retained the ball, and stifled anything that Charlton tried to create. Ironically, whereas against Norwich Charlton had failed to score during the early period, they found themselves two goals up thanks to some generous defending in this match. First, a long Danny Mills throw in from the right was not dealt with as Zheng Zhi challenged. The ball actually bounced over ZiZi and the defenders head and fell to Iwelumo, who gleefully thumped the ball into the net unchallenged from just six yards. Five minutes later and a long diagonal ball in from the right wing had Iwelumo’s knock-down falling to the unmarked Varney, and he knocked home his initial Charlton first team goal into the net of the team of his birthplace. After that, Charlton went into a lower gear, possibly wary of how the defence has gifted opposition goals earlier in the season, and mistakes were kept to a minimum. At half time, Radostin Kishishev came on for Leicester, and he got a warm reception from The Valley faithful in recognition of his seven years as an Addicks player. He actually had a couple of shots, one of which warmed the hands of Weaver, and therefore showed more attacking intent than he did during a large proportion of his Charlton career. Kishishev’s introduction, plus that of another defender in N’Gotty, meant a change of tactics for the away team as they engaged damage limitation mode, and less option for Charlton to play expansive football. Little of note happened in the second half therefore, as the midfield became clogged, and the two Charlton forwards were marshalled by three central defenders. The only other really notable things from the game were bookings for Izale McLeod (on as a sub for Varney) plus, in the first half, one too for Chris Powell. It has to be said that Chrissy fully deserved his yellow card, as his foul was an absolutely shocking and atrocious piece of shirt-tugging that could have caused some serious damage to the cotton material! Luckily, both the shirt and player involved were able to finish the match. My man of the match award went to Jose Semedo (left, congratulating Iwelumo on his goal) who really did look a classy player all day long. His work rate is exceptional, his passing generally accurate, he tackles well, and challenges at every opportunity. If I have to make one criticism of him (which is harsh, I know…), it is that he might want to think about shooting from 25 yards every now and then when he has a chance, rather than passing. 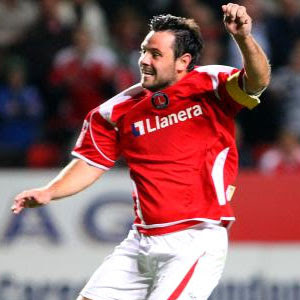 If he started to hit the back of the net occasionally, we would have a very, very valuable player on our books! Others who had very good games were Danny Mills (with no nasty stuff this match thankfully! ), Chris Powell (apart from that booking! ), and the central defensive partnership of Fortune and Bougherra. Those who didn’t shine were Lloyd Sam, who was marked tightly and had little chance to impress, and Andy Reid who looked like he had had a few Guinness’s too many watching the Irish rugby team the night before. Up to second place and into the automatic promotion places, the team must guard against complacency and continue to gel and push on; they can definitely get better! Thankfully, the next match is a midweek league cup tie against Luton, and the great squad that Pardew has built will be used to the maximum. This should ensure that those currently in the starting eleven for league games cannot sit back as there is always another player pushing for their place. The future is a rosy Charlton red, and most definitely bright! Charlton take on Leicester City on Saturday and the Addicks will be looking for another three home points to push them ever closer the top of the league table. Tuesday’s home win over Norwich was well earned, if a little late in being confirmed, and a similar display (with better finishing) should see Charlton claim another victory this weekend. It’s always interesting to read other blogs and the media's “official” match reports, and this week plenty has been written about Tuesdays game against the Canaries, plus Luke Varney’s debut, and Danny Mills game-running feud with Huckerby and eventually Dublin. On the match, the correct result was achieved, but as it came via two late penalties, some negativity has been seen; this really does miss the point. For long periods (the first twenty-five and last twenty minutes approximately), there was only going to be one winner of this match, Charlton were that dominant. The only sour note was that possession did not equate to goals earlier. Mind you, if any or all of the three attempts that hit the bar had gone in, things may have turned out differently! With Mills, it seems that he is on the edge with every game, and everybody seems to hate him. Upsetting Croydon fans on his re-debut is one thing, but he then came up against two teams that were local from whence he started, and that was guaranteed to bring him stick. At Layer Road, he came under abuse but maintained concentration, and did a good job. A couple of fouls were timed well but, had they been a fraction off, could have been dangerous, and may have resulted in a card to match his shirt. Similarly, on Tuesday, he was under pressure verbally most of the match it seems, but when Huckerby’s (and later Dublin’s) frustration came out, he remained on the pitch and relatively calm. He possibly should aim for a quiet game on Saturday, if just to take the pressure off himself and maybe Pards will think about bringing Yassin Moutaouakil back in when the game gets a bit interesting for Mr Mills. 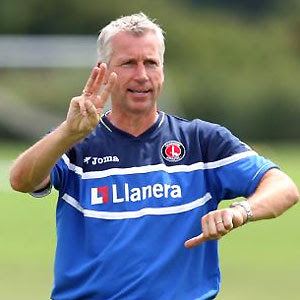 So to the Leicester game; Alan Pardew seems to have pretty much everyone available again. The apparent injuries at Colchester to Todorov, Fortune, and Iwelumo were obviously not as bad as they looked, and all could have played on Tuesday (and two did). Moutaouakil made a surprise appearance on the bench if not the pitch too, and that only leaves Holland, Thatcher, Gibbs and Sankofa as probably not ready for Saturday though all are back in training. Whether the squad availability brings changes from Tuesday’s line up is not clear, especially after such a good performance, but with the possibility of a rotation policy being used, I expect a couple of players to be rested/brought in. In goal though, Nicky Weaver is a certainty, and Darren Randolph will provide adequate back-up from the bench. Mills will probably start ahead of Moutaouakil at right back, and Powell in front of Thatcher (an ex-Leicester player) on the left side. In central defence, I expect the excellent midweek partnership of Fortune and Bougherra to continue, with Sodje as back-up leaving another ex-Leicester player – Paddy McCarthy – out of contention. Up front, the choice gets harder every week! Iwelumo looked slow and a little tired to me against Norwich, so maybe his injury was a bit worse than he told Pards before kick-off! Varney is getting fitter with every outing, and Izale McLeod really did a job when he came on for his ten-minute cameo. Then we have Todorov fit again, and looking to regain his place after a three-game scoring streak. Substitutes from Randolph, Moutaouakil, Sodje, McCathy, Racon, Sinclair, Ambrose, Thomas, McLeod, Varney. Leicester are having a very average start to the season, much as Norwich, and in fact sit one place (and one point) below the Canaries, but with a game in hand. Ex-Addick Radostin Kishishev has been out of the starting team recently, but has been introduced during the second half of the last two league matches. Many Addicks hope he is in from the start this weekend, however it is doubtful he will be backed to score against Charlton as Kevin Lisbie widely was last weekend! The Foxes won many plaudits this week when they “gifted” Nottingham Forest a goal at the start of their re-arranged league cup tie, after the original leg was abandoned (with Forest winning) due to Clive Clarke having a heart attack at half-time. Leicester went on to win thanks to two very late goals in that game, so fans are warned not to leave before the final whistle at this match! Pedro45’s score prediction has to be based on how we might play, and who the opposition are – I cannot see Leicester causing more problems to this Charlton team than Norwich did (and probably less in fact). I will therefore predict a 3-1 win, in the hope that some of that possession we are bound to have is transferred into better goal-scoring opportunities, and that chances are taken. My one-to-watch this game is going to be Zheng Zhi (left). Bound to start, ZiZi is starting to settle back into English football, and in his favoured central midfield berth. Alongside Semedo, he is forging a powerful partnership, but, especially in home games, he needs to make more forward runs into the penalty box when the wide players are holding the ball (pretty much as Ambrose does) so that the presence of Iwelumo, Varney, etc, are helped and any knock-downs fall to red shirts. In some ways, Watford’s away win at Cardiff on Wednesday night has taken some pressure off the Addicks – we cannot go top this weekend now. 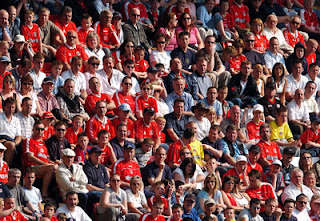 The players are fans know, though, that only a win will do at home, and that with second place Bristol City taking on sixth pace Burnley, three points may move us up to second. The teams just behind us also have quite tough games (in this relatively even division), so that win could provide the gap between the top two and the also-ran’s which hopefully will just get bigger as the season progresses. Only then can we start thinking about the free-season tickets that we may all be getting next season. For the first twenty-five minutes, Charlton looked like world-beaters; you remember when we used to play Arsenal in their pomp? You know, Terry Henry and all that ripping us to shreds, going two up after five minutes and then coasting the rest of the match…well, it was like that for the first quarter of the game, except we didn’t score like Arsenal did! The passing was great; Reid, Zhi, Semedo, and Sam were knocking it around between them, making the Canaries look second-rate, moving the ball forward, but lacking in the final ball, or a decent cross, or trying just a little too hard for that killer ball. Any potential Norwich attacks were quickly snuffled out as Semedo and Zhi dominated the midfield areas. Charlton hit the bar twice in this period – the first a looping header from Iwelumo that bounced down the wrong side of the line, and was desperately cleared away for a corner (left), and then a deflected free kick from Reid was also headed onto the top of the crossbar by a defender. Then it all changed. Without the early goal, the crowd became quiet, and the away support more vociferous. 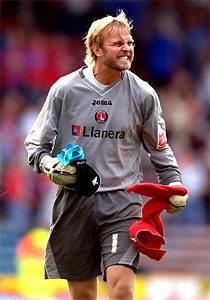 Bouyed, the away team started to come at Charlton, and it was only a great save from Weaver that kept the scores level. Half time came, and it was the home side who were probably the more happy to hear the whistle. 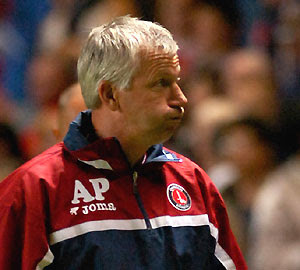 Alan Pardew chose to keep the same eleven on the pitch for the second half, and once more Charlton started to dominate, though not in quite the fashion of the early period. No clear strikes on goal came though; Reid curled another free kick onto the top of the bar, and Zhi headed at the keeper. Weaver was pretty much a spectator except for kicking the ball away from back passes. The recalled Bougherra and Fortune did an excellent job in snuffing out the Norwich threat, and Darren Huckerby ended up a frustrated man after failing to get any change out of Mills. Luke Varney ran his heart out, and it was great t have a channel runner (in the Garry Nelson mould) back in the team. Iwelumo though struggled to get any good ball to him though, but some of that may have been the number of times he was being fouled. The referee (Mr Singh) actually had an excellent first 75 minutes or so, often allowing play to continue either to an advantage or then bringing the ball back for a free kick if no advantage resulted. Sadly for the ref, the game became fractious as both sides came under increasing pressure; Charlton to score, and Norwich to hold out. Several times shouts went up for fouls in and around the box when Iwelumo, Varney, and later McLeod (who replaced Varney) challenged for the ball, but all appeals were waived away. With just five minutes left, McLeod burst into the box, and was knocked to the ground. The whistle went but the linesmen appeared to be signalling a corner kick. After a brief discussion with Mr Singh, a penalty was awarded, and Andy Reid stroked it into the bottom corner for a one-nil lead. A couple of minutes later, and McLeod controlled the ball on the left wing; he then broke between two covering defenders and was then again brought down from behind. Once more, a penalty was awarded and Reid chose the same side but with more power and higher. Danny Mills regular match day fued did boil over right at the end, soon after he was thought to have elbowed Huckerby, Dion Dublin chose to hack him down in a vicious fashion from behind chasing an aimless ball out toward the corner flag; Mr Singh had no hesitation in sending Dublin off for an awful foul. That was pretty much it, though we did have a shout for a third penalty even later! Three points takes Charlton up to third in the table, and a win on Saturday against Leicester could improve that placing yet again. It was a good, solid performance, and the side really is starting to settle down and take shape. My man-of-the match was Lloyd Sam, who ran at the defence at every opportunity and put over some good crosses, but honourable mentions should go to the impeccable Bougherra, solid Semedo, hard-working Zhi, and classy Reid. The games are coming thick and fast over the next few weeks, and no sooner have Charton finished with one East of England side, then along comes another. Norwich are the visitors to The Valley on Tuesday evening, and the home side will be looking to build on their good start to the season, which has seen them rise to fifth in the league. Alan Pardew announced late last week that his treatment room was finally empty, and that players like Gibbs, Moutaouakil and Holland were now back in training; sadly, after Saturdays game at Colchester, three different players replaced those in the medical department mentioned above, and it is doubtful we will see all three taking the pitch on Tuesday. Officially, the talk is that Todorov (who has scored in his last three games) and Iwelumo (who hasn't) both suffered from severe cramp on Saturday; when you saw how watered and soft the pitch was at Layer Road, that is no great surprise. I must say though that when both players went down, neither looked like it was cramp that was bothering them. Similarly, Jon Fortune defintely got a knock (on the toe - broken metatarsel anyone?) and I'd be surpised to see him available or risked. Luckily, as nearly everyone is fit, Charlton can cope with losing three first team players in one fell swoop, as long as it's not for too long. With goals being conceded too easily, Fortune and McCarthy were under pressure in defence, and one or both may have been dropped in favour of on-loan Sodje and the fit again Bougherra. From having a full cupboard upfront, we are less well off now, but we will have a chance to see how Luke Varney fares on what must be his home debut, and the options are to bring in Izale McLeod (now that would be a fast front line if he was paired with Varney!) or utilise Darren Ambrose or Zheng Zhi in attacking roles. Even back-from-Crewe Chris Dickson could come into the equation if Toddy and Big Chris are ruled out. As we do have a fairly large squad this season, who's to say that Pards may not make changes anyway, because he can, and give chances to some of those on the fringe of the first team (Racon, Sam, etc). Subs from Randolph, McCarthy, Sam, McLeod, Racon, plus any of the players who have recovered from injuries. Norwich have had a slow and unspectacular start to the season; there never seem to be that many goals in their games, but with Jamie Cureton up front and the possibility of Charlton's generous defence being seen once more, we could be in for yet another hatful of goals in SE7. Pedro45's score forecast suggests otherwise (but then again, how many times in a season do I guess right?!?) - I'm plumping for a 1-0 home win with, at last, a solid show at the back. My one-to-watch is the man who is likely to make his home debut; it could be as a sub if others are fit, or he may get a start if the manager thinks he needs him, but Luke Varney (left) is about to become another of those two million pound players who grace The Valley in a Charlton shirt. Hopefully he will prove to be better value than some of those who (embarassingly) have moved on a year or so after signing for similar amounts (Traore, Faye, etc). This will actually be my first home league game of the season, having been out of the country when we played Scunthorpe and Sheffield Wednesday. I'm looking forward to re-claiming my seat but sadly not to seeing/hearing the two guys who have sat behind me over recent seasons. I believe (from friends who went in my stead in August) that one at least has returned (the better option at that, thankfully) but maybe not the other (who may go and watch his first choice Spurs now that Premiership football is not available at The Valley). Whoever I'm surrounded by, it will be good to be back. Bearing in mind that there is an awful lot of whingeing coming out of the Colchester camp about the "foul" on Chris Iwelumo that got Matt Connolly sent off, I wondered if anyone who was there saw Teddy Sheringham's punch (the TV obviously didn't show it...) ? Fifteen minutes gone, corner to the home team waiting to be taken, and teddy-boy thumps his marker flush on the cheek. The referee didn't see it, but quite afew in the away end did I hear. How would Colchester have got on playing 75 minutes with ten men, as opposed to just 35? To finish this brief blog on a nicer note, it was cute to see Kevin Lisbie's little son - just five years old - thumping in a (five-yard) penalty during the half time break. In years to come, he will be able to say that he too scord in that goal at Layer Road on September 15th 2007, just like his dad! Charlton’s away game at Colchester on Saturday lays a quiet passage to rest amongst Addicks bloggers, and a return to work after the strike action prompted by NYA. I’m really looking forward to this weekends game as it will be the first game I have stood up at (legitimately) for years, having only been able to get a terrace ticket. It’s tough remembering the last time I stood on a terrace – I seem to think it was Reading, way back in the late nineties, but I may be wrong? Others will also be looking forward to the game; notably all those professionals with ex-Charlton and ex-Colchester connections who wil be involved. For United, Kevin Lisbie will probably play against his previous club, and Charlton fans will be able to see whether he is as bad as they think, or someone who has slipped through the net and could have done a job for the club in this league. For Charlton, big Chris Iwelumo returns to the ground where he plied his trade last season, finishing top scorer, and Alan Pardew’s Assistant Manager Phil Parkinson returns to the town where he was in managerial charge during a very successful period up until the start of last season. Parky had taken Colchester to promotion, but left somewhat under a cloud after the club first refused permission for him to talk to Charlton (prior to Dowie being appointed), and then let him go off to Hull, where he struggled and didn’t last much longer than that man Dowie! All three individuals will be very keen to come out on top in this match! Colchester have had an indifferent start to the season, scoring plenty of goals (including Lisbie, who has two), but conceding even more. They have scored twice on four occasions this season, but have struggled to win, and lost their last match, 3-2, at home to Burnley. Charlton, on the other hand, are starting to hit form, with three consecutive wins in the bag. Bearing in mind the defensive problems that Charlton have had (conceding soft goals against Sheffield Wednesday and Stockport for instance), this game could be as goal-ridden as Charlton’s midweek reserve team outing which finished 8-4! In goal, I expect Nicky Weaver to continue, with Darren Randolph (who is in very good form too it seems) on the bench. Defensively, loanees Danny Mills and Sam Sodje are likely starters, with Chris Powell filling the left back slot. Either Madjid Bougherra (returning from injury and international duty), Paddy McCarthy or, more likely, Jon Fortune will play alongside Sodje. In midfield, it seems that everyone except Matt Holland is fit. Pardew can chose his best formation and hopefully pick from Andy Reid, Therry Racon, Jose Semedo, Darren Ambrose, Zheng Zhi, Jerome Thomas, Lloyd Sam, Martin Christensen, and Dean Sinclair. Up front, the bare cupboard is well and truly being forgotten, with Todorov, Iwelumo, McLeod, plus Varney and even James Walker (both banging them in for the reserves) available. Subs – Randolph, McCarthy, Racon, Ambrose, Varney. The confidence that Charlton have gained from the last three games, and especially from the clean sheet won in the last outing, should hopefully see them pick up another three points and continue the march they are making up the Championship table. Pedro45’s score forecast is a relatively comfortable 3-1 win. My one-to-watch in this match is going to be Chris Iwelumo. Big Chris should have plenty of friends left in this barracks town, as he played his heart out for them over two excellent seasons. Although he left to join bigger fish on a Bosman, hopefully the home fans will appreciate that he was only doing what any one of them would have, given the opportunity to treble (and more) their wages. Charlton fans are warming to big Chris, and see that his kind of effort (i.e. on the pitch) is preferable to that shown by the previous centre forward who is no longer at the club (and who left his best moves for the dance floor). He also scores more than the previous incumbent (sic)! I bet the Charlton manager has a smile on his face as wide as the M25 at the moment, following the Addicks win in this South London derby. 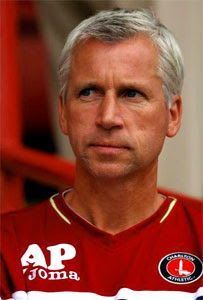 Pards played for both clubs during his career and professes to have a love for each team. Luckily, his current employers were the ones he cared more about and he ensured a terrific result for South London’s finest. The great thing about the manager is that he seems to be showing us fans what he really is all about. I admit I have yet to be fully convinced, but this weekend went a long way to showing me that he can be a good front man for Charlton, and that he could even be better than that. Tactically, he showed he is flexible, as he started with the 4-5-1 formation that has been called for in relatively tough Championship away games. This needs him to be hard on some players, who may be left out or on the subs bench – but needs are needs, and I’m sure that players won’t mind (too much) as long as the results continue to flow. This weekend, it was Lloyd Sam – my midweek man-of-the-match – who was left out entirely, and Svetislav Todorov who was, somewhat controversially, left on the bench. The great thing about being flexible is that you can change things when the situation demands it; on Saturday, rather than have to panic when it has all gone pear-shaped in the first half, Pards picked the right side/formation from the start and was then in a position to go for the win midway through the second half. It worked a dream as, shortly after his introduction, Toddy strode on to Iwelumo’s flick, nudged between two defenders and poked the ball over the keeper, and then rolled the ball into the empty net. Todorov wheeled away toward the Charlton fans in delight, and was jumped on by delirious team-mates. Of course, you need to have the squad capable of playing in this flexible manner, and whereas Curbishley chose to have flexible players capable of playing in more than one position, Pardew now has a squad who can cover any required option. And that is to Pards credit; he has built a squad in the transfer window that can cover any formation option – 4-3-3, 4-4-2, 4-5-1, or even 5-4-1, we shouldn’t have too many problems covering all these as and when they are needed. He has also recently dispensed with those liable to sulk when they are left out on favour of a particular game need (no names necessary). Of the team who played on Saturday, mention must be given to Nicky Weaver, who is settling in to the Charlton goalmouth, and made some fine saves; Jose Semedo, who looks like a tremendous prospect; Andy Reid who ran the whole show; and Danny Mills, whose second Charlton debut finished in the same result as the first – he is a winner! Overall, we wook to have far too much class for this division, and have rightly been made favourites once more. Looking at early season form, the rivals we should care about are Watford, and maybe West Brom; it's early I know, but I'm not sure any others can get too close to us this year, and I bet that their blogsites are citing Charlton as the team to fear. We now have a couple of weeks during the international break to savour the victory that came on Saturday, and look forward to continuing our march up the table (we are now seventh) and back toward the troubled Premiership.